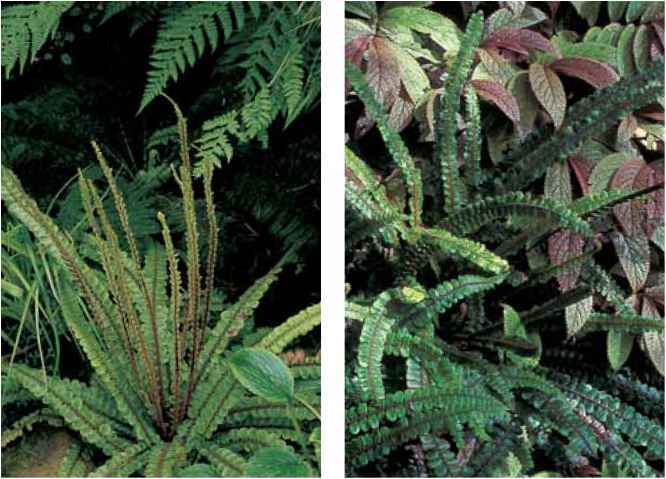 With their kelly-green fronds in straplike or various configurations thereof, the hart's tongue ferns can be remarkable additions to the garden's fern portfolio. Phyllitis from Dioscorides' Greek means "simple frond." The common species, P. scolopendrium, as opposed to its multiple varieties, is an upright, unbranched (entire or simple) "tongue" growing from an erect rhizome. Short succulent stipes, with back-to-back vascular bundles, lift emerging fronds looking like budding Jacks in the pulpit (arisaemas) but expand instead into symmetrical rosettes of flared greenery. Their unfurling shape is credited as being the long-ago pattern for the scrolls (fiddle-heads) on the tips of violin necks. Sori line the fronds in a regimented herringbone series of buttonholes which, when enhanced by backlighting, are an elegant lesson in soral patterning. They are paired along the free veins and open, facing each other as mirror images, splitting longitudinally and exposing the sporangia like peas in a pod. Sori in the close relative Asplenium open as a single valve along a vein. 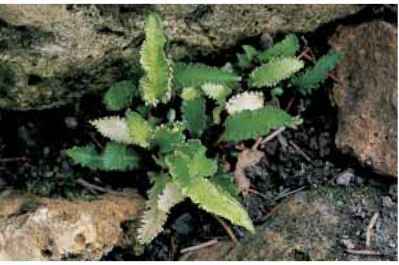 Phyllitis is frequently consolidated with Asplenium, however, and hybridizes with its species. 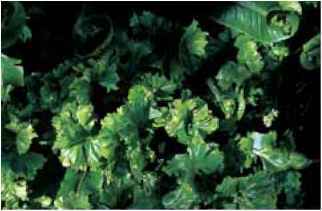 (Furthermore, in a remarkable signature botanical event, Phyllitis scolopendrium crosses with the hybrid Asplenium ebenoides [A. platyneuron x Camptosorus rhizophyllus] to give the fern world its only tri-generic hybrid.) Based on the difference in soral structure and the classification presented in the works of respected authorities (Page 1982, Mickel 1994, Hoshizaki and Moran 2001), my personal classification preference is Phyllitis. Worldwide the distribution is extensive and includes Europe, Asia, North Africa, the Middle East, and North America. Universally these ferns are primarily associated with limestone rocks and substrates. The rare North American native, Phyllitis scolopendrium var. americana, grows almost exclusively in shaded quarries and limestone-rich habitats frequently in hardwood forests. Alert visitors to Europe and Britain will find their native species, and an occasional variation, in mortared rubble on antiquities, faces of buildings, and in chinks on roadside walls (and can amuse the locals by taking close-up photographs of their "flora"). Garden specimens do acclimate in circumneutral soil as well but appreciate an amendment of ground oyster or eggshells, concrete pebbles, limestone chips, or other additives that offer a steady and slow release of lime. Powdered supplements of dolomite or lawn sweeteners are not recommended. However, fellow enthusiasts give an endorsement to pelleted dolomitic limestone. Propagation from spores is an educational and horticultural adventure as the progeny often offer extremely irregular deviations in foliar architecture. These are, however, not your named varieties which in order to be correctly offered as a given cultivar usually need to be reproduced vegetatively by tissue culture or division. 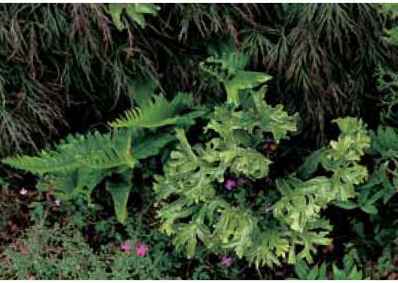 Or they can be propagated, in a most unusual fashion for ferns, as pseudo-cuttings from leaf stalks. To do so the fronds need to be stripped back from their base rather like peeling cloves from garlic (thus potentially destroying the parent plant incidentally, so chose with care), cleaned, and inserted into a propagation flat containing a receptive mix of moist sand and a token handful of basic compost. Another recommendation is to use old (dead or dead-looking) frond bases with whatever remnants of roots remain attached, without digging up the parent, and plunge them into moist sphagnum moss. With time and luck the basal buds will form new plants. The association of the heart-shaped frond base and romance offered some remarkable as well as opposing "signature" properties. A distilled drink infused with "essence of hart's tongue," for example, offered protection against the "passions of the heart," while wearing an amulet of the fronds was supposed to be effective in preventing conception. "Just how effective seems not to have been recorded" (Page 1988). 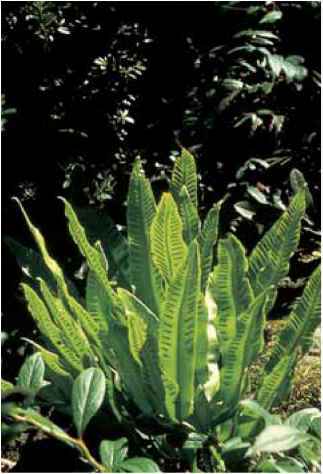 Hart's tongue fern Synonym Asplenium scolopendrium Epithet means "with multiple legs like a centipede," in reference to the sori. description: The rhizome is erect. Short stubby stipes are plum and green and when unfurling are trimmed in a suit of soft white downy hairs. Simple, undivided blades are erect with a heart-shaped base and pointed apex. The sori are in pairs along the veins and open as bivalves. range and habitat: The European species, which is what we see, along with its varieties, in cultivation, grows with abandon in Britain, Europe, and beyond. I have seen it circling in concrete cracks under the protection of open lattice manhole covers, colonizing in limestone-enriched supports under wharfs as well as in the traditional sites that are blessed with a measure of damp mortar and partial shade. 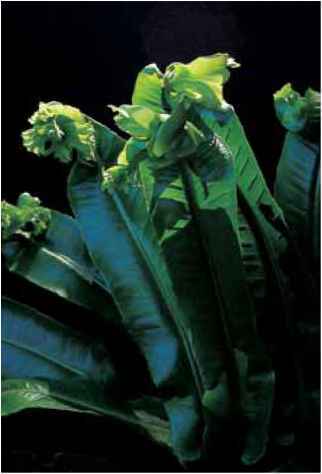 The temperamental, cultivation-resistant North American differs botani-cally by, among other traits, generally being smaller and having short sori strictly on the terminal portion of the frond rather than elongate sori that are distributed along the length of the frond. It is native to, and happy in, limestone habitats in upper state New York, Michigan, and the Bruce Peninsula in Ontario, Canada, with a few odd outlying crops in Alabama and Tennessee. Upright undivided fronds of Phyllitis scolopendrium in the Miller Botanical Garden. Note the buttonhole pattern of the sori. longer a problem. While all of these threats to success may sound formidable, the plants are resilient and formally ornamental (and chewed foliage can just be given a varietal name). And varieties there are in Victorian abundance. Lowe (1908) lists 437 cultivars (and apologized for not listing them all) in 16 subdivisions. Frond variations in a Phyllitis collection in the Graham garden. A striking alteration on the apex of a Phyllitis frond in the Graham garden. combinations thereof. Give them a place of honor in the garden's foreground. Crested varieties include a multiplicity of types listed under the umbrella of Phyllitis scolopendrium 'Cristata', which has forked tips on a single plane up to multi-divided heads of cresting crests. Crisped and undulate culti-vars have wavy, crinkled, and frilled margins. (This ornamentation has been described in literature since the early 1900s as resembling an Elizabethan ruff.) Beyond that the distinctions are more finely defined, ranging from crumpled and ridged margins to twirled spirals of fronds. A sampling of those available, often appropriately presented as "group" denominations, are listed here. Crispa Group, a generic and very handsome group, includes undulate types with frilled and wavy margins as described above. 'Crispa Bolton's Nobile' is a standout in British collections and a well-photographed specimen in the elegant rock and perennial garden displays at Britain's Sizergh Castle. Like many of the "undulate" and "crisped" types, the cultivar is sterile, but is marching out with a welcome band of fanfare from tissue-culture labs. It will hopefully soon be a staple in Phyllitis displays. Others in the group include 'Crispa Cristata', which is both wavy margined and forked; 'Crispa Fimbriata', an amalgamation of wavy margins with fringed edges; and 'Crispa Golden Queen', which is undulate and mildly variegated with horizontal lime striations (and not suited for sunny exposures). Cristata Group has an array of cresting ranging from the simple forked apex in 'Cristata' to multiple shredding, described by terms such as digitata (fingered) and ramo (branched). 'Ramo Marginata', for example, is divided into many fingers extending from the base of the frond and looks like a ferny equivalent of escarole. Heavily crested types such as 'Capitata' (headed), 'Corymbifera' (clustered), and 'Grandiceps' (with large terminal crests) have fronds that are simple at their base, but are topped with ornate headdresses of dissected foliage. Do, however, protect these terminal embellishments from collecting excessive amounts of water, which is an invitation to breakage. Fingers on the frond tips of Phyllitis scolopendrium 'Digitata'. Variations on a variation, the Phyllitis scolopendrium Crispa Group. (Left) In the Stobbe garden. (Center) In the Kaye garden. (Right) In the Rickard garden. are 'Kaye's Lacerate', a leaf lettuce of a fern with fringed edges, and 'Peraferens', which in an amazing display of foliar acrobatics has a curled frond apex enclosing a minute extended needle of foliar tissue. Both come true from spores. Other variations in addition to the crisp, crested, and undulate include marginate in which the fronds are horizontally ribbed, muricate with rough surfaces, and sagittate in which the frond's lower portions extend like lateral arrowheads. Phyllitis scolopendrium 'Marginata' with stiffly ribbed frond margins in the Carstensen garden. named cultivars) giving gardeners, and especially collectors, an abundant choice of individual selections with unique characteristics. 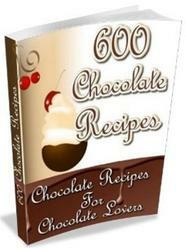 Within this in cookbook full of chocolate recipes you will find over 600 Chocolate Recipes For Chocolate Lovers.